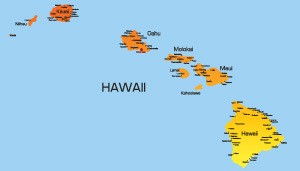 Hawaii is the most recently incorporated state making it the 50th state and has a population of 1,300,000. The stateÕs nickname is The Aloha State which stems from the native inhabitants Hawaiian language. The capital of Hawaii which has a population of nearly 400,000 people is Honolulu. This state is a major tourist destination where millions of people come every year. Tourists can fly in on many of the islandsÕ airports most notably Honolulu International Airport. After you rest in the many resorts and hotels on the islands you can attend any event such as the Merrie Monarch Festival or the Rainbow Film Festival. The largest university in Hawaii is The University of Hawaii at Manoa.